Falafel can be reheated in minutes and make a delicious vegetarian supper when rolled in warm flour tortillas with guacamole. Preheat the oven to 190°C, gas mark 5. Place the falafel on a baking sheet and cook for 10-12 minutes until piping hot. Meanwhile, place the garlic and mint or coriander in a food processor and whizz until very finely chopped. Add the avocado cubes and 2 tbsp cold water and blitz again until smooth. Stir in lemon juice to taste. Reheat the tortillas according to the pack instructions. 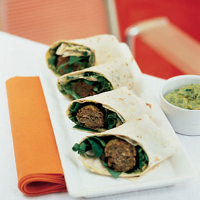 Divide the salad between the 8 tortillas, top each with falafel and a generous spoonful of guacamole. Roll up each tortilla and eat straight away.